Enjoy indoor benefits in your outdoor space. 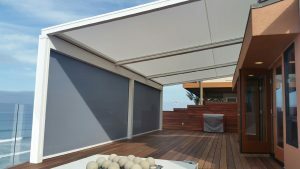 The dynamic design of Retractable Vertical Screens provides protection from sun, wind, and insects while allowing fresh air to flow freely and natural diffused light to pass through. Perfect for patios, decks, and interiors that feature moving glass wall systems, Retractable Vertical Screens add top-quality style and innovative functionality to commercial properties and luxury homes. When your property requires upscale aesthetics and creative solutions for managing the elements, Vertical Screens add comfort, sophistication, and value to your outdoor spaces. Designed for performance and durability, Vertical Screens are customized to the specifications of your project. 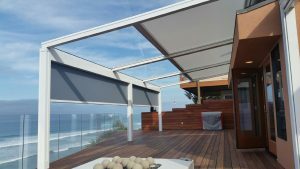 Using revolutionary wind-resistant tensioning technology, Vertical Screens are incredibly durable shade solutions that can withstand wind loads up to 80 MPH. Windproof in every position, you’ll never experience the flapping and tearing that were once common for these types of screens. For properties that require more substantial wind load capacities, an Eide engineering specialist can help to identify the best-suited solutions. Featuring a sleek box with a discreet bottom rail, Retractable Vertical Screens offer two design options: one with clean lines and a minimalistic look and another with a gentle curved profile. Both integrate the feed cable into the side channels, so they are concealed from view. Unlike traditional window shades, Retractable Tension Screens incorporate electric motors and a wear-resistant top coating for convenient, quiet, and smooth operations. The profiles are available anodized or powder-coated in any RAL color. Perfect for projects both big and small, these designs are able to span long distances – up to 236 square feet. Vertical Screens are ideal for both new constructions and renovations, and they’re suitable for all window types, including aluminum, wood, and PVC. Vertical Screens are available with fiberglass or Soltis® fabrics, and they come in a wide range of color options, including blackout fabrics. Are Retractable Vertical Screens Right for Your Commercial Property?